Annual Yosemite “Traincation” | Trace B. My second trip to Yosemite and I am so in love! This year’s trip was much different than last year, but amazing nonetheless. This year we came prepared and we didn’t call this three-day trip a vacation, we called it a “traincation,” as we were ready to crush our time from last year (Curry Village to Half Dome and back down through Vernal falls). Having been training on the trails and even running a few 50k training runs this year, Ash and I were eager to see our improvement, and of course, enjoy the beautiful scenery. 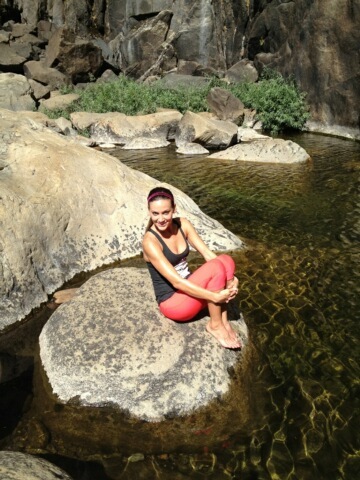 A little foot soak at Bridal Veil Falls. As soon as we got there, we headed over to Bridal Veil Falls as suggested by a guy we met on our way up. This place was gorgeous but the SHORT hike and very big and slippery rocks that led to the falls were really dangerous — Ashley slipped and fell on her already hurt shoulder and I carelessly jumped off a rock and hurt my ankle! Great, and only on our first day! My ankle wasn’t hurting too badly so Ash decided to stay back while Dom and I continued up. It was very gorgeous up there at the falls and I quickly soaked my ankle for a few minutes just to be safe. We headed back down and continued on our way to Curry Village. Later that evening my ankle really started to swell and ache and I was so worried that I wouldn’t be able to hike to the top of Half Dome, that I decided I would opt out of the 27 mile run/hike planned for the next day. Why me?! Ha. Anyway, I enjoyed my alone time that day at relaxing at the lodge with my laptop, Kindle, compression socks and lots of ibuprofen. By the end of this day, my ankle was feeling pretty good and I was confident that I would be ready to get up at 3am and begin the journey. Before hearing the alarm that morning, I headed out of our soft-sided cabin to use the restroom. When I came back and hopped back into bed, I heard this weird crinkling noise around my Gatorade bottle. Turns out that I let a mouse in when I left the door cracked on my way to the bathroom. What I had forgotten to mention earlier was that there had been a Hanta Virus outbreak at Yosemite that is contracted through deer mice feces and six people had already died. The source for the virus appeared to be somewhere in Curry Village where we were staying. We weren’t too concerned about it though because the outbreak had ocurred over six weeks ago and our camp was still open. In fact, we we able to get Half Dome permits easier through the lottery since a lot of people backed out of their trip because of the scare. Anyway, I freaked out when I saw that mouse just because of the recent outbreak. We kicked the little guy out and I passed out again knowing we had an early wake-up call. We wanted to leave super early this year to get to Half Dome to beat the heat and also so we could get up Half Dome without a lot of other people around. Last year when we went up the cables, there were so many people going up that we had to keep stopping to wait for people as they clipped their way up. We didn’t have a problem waiting, getting up there is very challenging, we simple had a hard time holding on to the cables and not moving upward as we waited. It really felt scarier having to stop every 5 steps or so. As soon as we started, we took off, practically power-walking the whole way. Last year we thought we were so awesome for getting there and back in 10 hours or so but this year we got to sub-dome in a little over three hours! 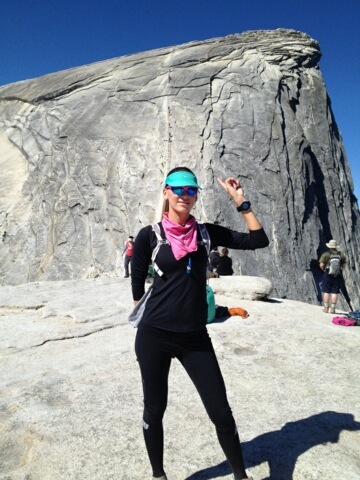 Half Dome all to ourselves! Heck yeah, I just got back from up there! 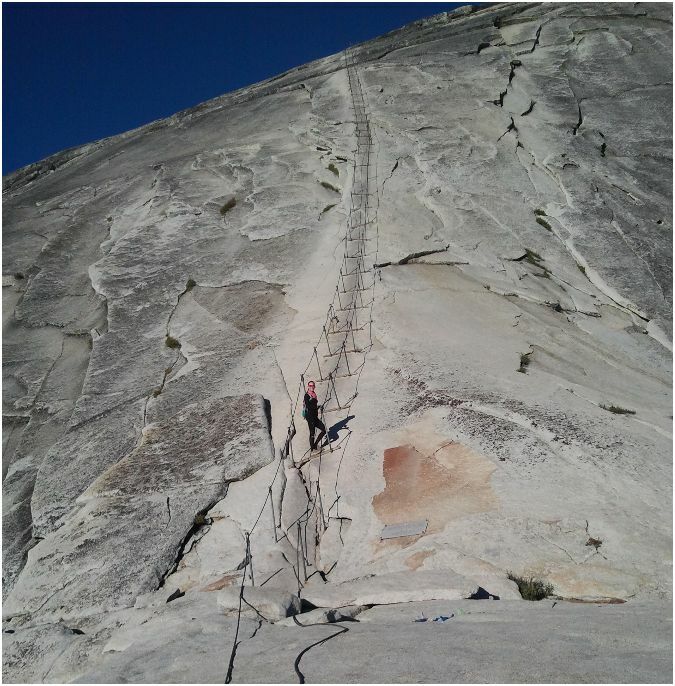 I will never forget the fear I felt when we got to the base of Half Dome — I was really scared to go up, especially without cables. I really didn’t trust myself to get up there without slipping or doing something careless. This year, I didn’t feel uncomfortable at all. I was nervous getting there and then once I saw it, I was so ready to go up. Ash and I took a few photos before we started the ascent and were at the top in less than 10 minutes. Our plan for leaving early worked, we didn’t have to wait for anyone going up. We just walked to every corner at the top, admiring all the views, took a lot of photos and finally, we built our own little peace towers amongst the hundreds of others. After being up for about an hour, we decided to head back down. By the time we got to the Village, we realized we shaved nearly four hours off our time from last year! We were really overwhelmed, taking in all the beautiful scenery that nature had to offer us and we were so grateful to be healthy enough to experience such a trip. Mariposa — last stop before heading home. Well, last stop before the Dirty Donkey! The next morning before we headed home, we headed over to Yosemite’s Mariposa Grove which is home to many giant sequoia trees, including Grizzly Giant, a 2700-year-old tree! We were in a hurry to get back home and beat traffic so we opted for a quick two mile hike. It was very beautiful here, and the trees, wow, gorgeous and HUGE. 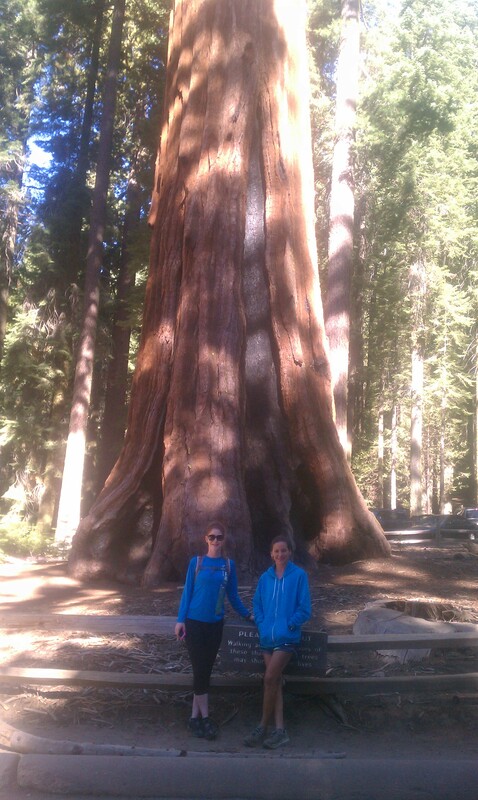 Just being here makes me want to go to the Sequoias! Overall, an amazing trip and I can’t wait to go back. This entry was posted on September 13, 2012 by tracebee. It was filed under Uncategorized .